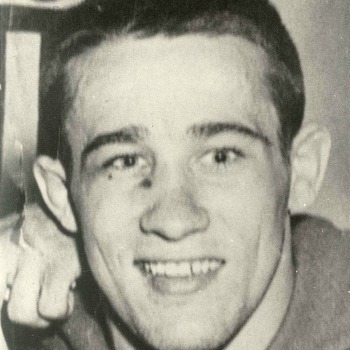 Bill Nelson, three-time NCAA wrestling champion for Iowa State Teachers College (now University of Northern Iowa) and 1948 U.S. Olympic team member who went on to coach at the high school and collegiate level, passed away Saturday, Sept. 23 in Sun City, Ariz. He was one month shy of his 91st birthday. William J. Nelson was born on Oct. 24, 1926 in Jewell, Iowa, the son of Harry and Fern Nelson. He wrestled at Eagle Grove High School in north-central Iowa, where he was a three-time placer at the Iowa state wrestling championships, winning the heavyweight title at the 1945 tournament. After graduating from high school, Nelson headed east to ISTC/UNI to wrestle for head coach Dave McCuskey, joining a team which included, among others, Bill Koll(three-time NCAA champ and future UNI/Penn State coach) and Bob Siddens (future Waterloo West (Iowa Iowa coach who mentored Dan Gable). It was at Northern Iowa where Nelson won three NCAA individual championships: the 165-pound title in 1947 as a freshman, then back-to-back titles at 155 in 1949 and 1950. While wrestling for the Panthers, Nelson was undefeated in dual competition. A national magazine named Nelson the nation’s outstanding amateur wrestler in 1950, his senior year. Bill Nelson was a key component in Northern Iowa winning the team title at the 1950 NCAAs held on the school’s Cedar Falls campus. Five Panthers made it to the finals; Nelson was one of three home team heroes to win individual titles at the Men’s Gymnasium (now West Gym), joined by Keith Young at 145 pounds, and Bill Smith at 165. Nelson won National AAU (Amateur Athletic Union) freestyle titles his last two years at Northern Iowa. Bill Nelson’s college alma mater paid tribute to one of the school’s all-time great athletes on social media. 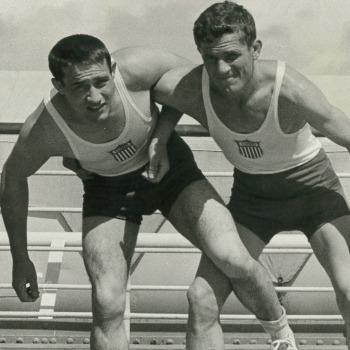 While an injury during the 1948 NCAAs denied Nelson the chance for a national title that year, he was able to wrestle at the U.S. Olympic Trials, winning the title and earning a place on the 1948 Olympic freestyle team. However, injury got in the way of Nelson competing in London; alternate Olympian Leland Merrill of Michigan State won the bronze medal for the U.S. at 73 kilograms/160.5 pounds at the 1948 London Games. After graduating from what is now UNI, Nelson launched a coaching career in both high school and college that spanned three decades. He started at Brighton High School in Colorado (1953-55); Osage High School in Iowa (1955-57); and Michigan’s Kalamazoo Central High School (1957-63). A decade of coaching at the high school level prepared Nelson to take the step up to the collegiate ranks. He served as head wrestling coach of the now-defunct mat program at the University of Arizona from 1963-1983. While at the Tucson-based school, Nelson coached six NCAA All-Americans, leading the Wildcats to seven NCAA top 20 finishes. He was also instrumental in getting the NCAAs to hold their 1976 championships at Arizona, the first time the Nationals had been held in the southwest U.S.
A dozen years after leaving Arizona, Nelson returned to coaching, working as a volunteer assistant at Bondurant-Farrar High School in Iowa in the 1990s. 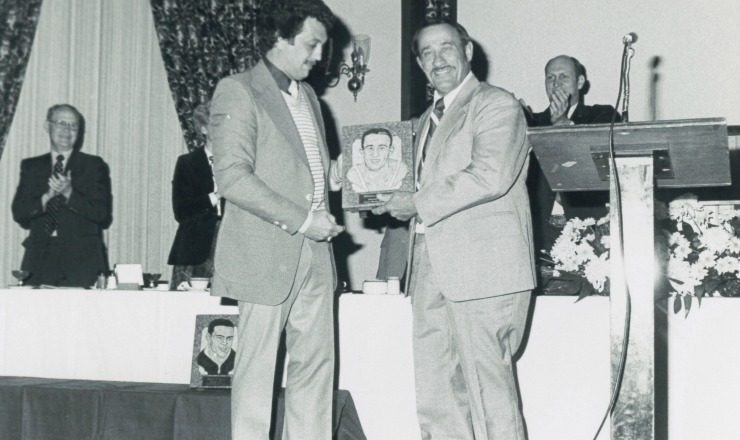 For all his accomplishments as a wrestler and coach, Nelson was welcomed into a number of halls of fame, including the Helms National Wrestling Hall of Fame in 1963, the Arizona Wrestling Hall of Fame (1977), the National Wrestling Hall of Fame and the Iowa Wrestling Hall of Fame (both in 1980), and the University of Northern Iowa Athletic Hall of Fame in 1987. Bill Nelson is survived by his wife of 70 years, Violet; two sons (William D. and Bruce); two daughters (Leanne and Lori); and numerous grandchildren and great-grandchildren. He was preceded in death by his parents and his younger brother Dale — like Bill, a 1945 Iowa state champ — who was killed in a car crash in 1946.